Today’s TMOE(ToastMasters Of the Evening ) was TM M.Y..
he made atmosphere by abundant and nice comments. and many members enjoyed using this word in their speech. The first prepared speaker was TM S.E. He is a newcomer of our club ,but a person with a wealth of experience. He explained his business experiences of foreign countries and the reason why he joined our club. and they supported his message effectively. And he praised TM S.E. had reviewed his speech script more than 10 times for himself. The second prepared speaker was TM T.M.,his speech title was “Another Gift”. He explained that he has obtained a lot of skills and confidence at this club. 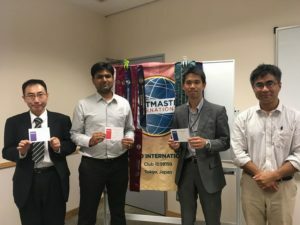 And also he was able to be present at the moment when talent of one of our members blossomed through this toastmasters activity. His message “All pepole have original unique talents and we can meet talents in this club” was so impressive. TM B.H.,the evaluator of his speech praised many good points,”CAPTIVATING” title,clear message and good examples and so on. He tried the evaluator role for the first time, but calmed down very much.